1Is the property cycle peaking and what does that mean for investment properties? Traditionally the property cycle has highs and lows and is location dependent. If the location you are looking at has experienced extremely high growth for a period of time it is likely that this will not be sustained so a fall will occur. 2How much cash up front will I need? This totally depends on your personal circumstances. If you have enough in your home and are able to use this then often no cash is required. If however you do not own any property then a cash amount of between 10 – 20% will be needed. 3Can I use my super to buy property? You do need to have a SMSF set up to invest in property and seek good advice from a SMSF specialist, as this is an area in which you need to have a professional look after it. We can recommend highly skilled and independent SMSF specialists. 4How do I pick the right suburb area to invest in? Do your own research but this can quickly become very confusing. Speak to investment consultants who have done this research for you. Population growth is integral to the growth of an area and this will depend on many factors. 5Can I do this myself? Like anything, any person has the opportunity to DIY. The question is does everyone have the knowledge, capability, skills and time to DIY. We endeavour to cut out all the legwork and provide a complete end-to-end property solution that in dollars and sense will always make it easier, save you time and money and give you the property solution you are looking for. 6What sort of maintenance costs will I need to budget for? For the 1st 3 years of a new property it will be very small, after that it is very dependent on tenancy. These costs are tax deductible and an investment property consultant should factor these in when doing a financial analysis. 7Can I claim travel to the area on my tax return? What about my partner and kids? Travel to an investment property can no longer be claimed unless under special circumstances but your accountant should be able to advise more on this. 8Where should I get funding from? I always recommend to use a mortgage broker as one lender or one loan does not fit all. Your personal circumstances will be taken into account when selecting a lender with your broker and if you don’t have a broker we can recommend independent brokers who specialise in getting loans for investors. 9I’m self-employed but I have a lot of equity in my family home - where can I get funding now the banks won’t talk to me? There are many lenders who will lend to self employed people with or without equity. How much they will lend you does depend on your declared taxable income and can be irrespective of the amount of equity you have. 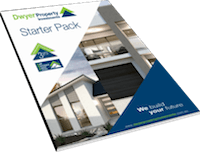 10How can I tell what quality level a new investment property will be built to? You need to research the builder yourself and never go with an investment company without knowing who is building the house. Also note that most investment companies who are not the builder will be getting a substantial fee from the builder for your business. This is generally added onto the build cost. 11What happens after the guaranteed rental period? You can remain with us under our standard property management or we will assign the property to any other agency you choose. 12Is the guaranteed rental for a particular amount? Is it matched to market rentals? How is it calculated? 13Can I use equity in my new investment home to leverage into another one, or are those days over now the banks are pulling back? Yes you can but it is dependent on a number of other factors as well. 14What happens if the property market slows? The real risk is that your property will not grow in value as much as you had hoped however if it has been structured correctly so that the rent covers the loan repayments you are not at any financial risk. 15Can I syndicate with others in my family? Yes but there are possible issues down the track if one member wants or needs to sell and the others don’t. Good financial advice to set up this kind of structure is recommended. 16What if my tenants don’t pay on time? Under the 3 year rental guarantee you get paid no matter what. After that period a good property manager should be across any arrears and remember there is still 4 weeks of bond to cover arrears. 17Newer houses seem less solid than old double brick - is this true? No as construction methods have improved and building legislation actually requires builders to build to a higher standard now. 18I heard investment properties in Qld have had rentals fall - is this true? The Brisbane apartment market has an oversupply which is creating rental price falls however Qld and specifically the Sunshine Coast (0.4% vacancy rate) still has one of the lowest rental vacancy rates in Australia. 19My partner isn’t keen on an investment property what should I do? Leave them and find someone with ambition who wants to have a secure financial future. 20I don’t understand leverage, what is it? You are not alone. Leverage in investment property is generally using equity in one property to invest in another one. Often the home you live in can be leveraged (take out a tax deductible loan against it) to use as a deposit for an investment property. A very common and sound practice if used wisely. 21With leverage what is the downside? If the property you have invested in goes down substantially in value and your asset is worth less than you paid for it, if you hit financial difficulty as well and you have to sell the investment you will lose money. Simply put don’t overleverage and if you buy in a solid market this downtown is very unlikely. 22What if I need money suddenly? If there is no other way to cover this need by a loan, then you may have to sell your asset. 23Is housing overpriced relative to other physical assets? Property has and will continue to be a strong asset. It goes beyond being purely an investment as investment properties often become people owner occupier homes so this asset continues to be in demand. 24Am I really investing in the land or is the house important in the long run? Both are very important but a good quality large house in a good location is better than a large block of land in an area of low demand. 25Do new investment homes depreciate like new cars? Similar yes but just at a different rate and unlike cars, the fixtures and fittings depreciate a lot in the fist 5 years whereas the house continues to depreciate at 2.5% for 20 years. 26I now hear people saying don’t negative gear. How should I decide? Negative gearing is still a very popular tax deduction but your personal circumstances and the property you purchase will impact this. Like loans, there is not one answer appropriate to every investor. 27How do I know what I can afford to spend? The first thing I do with all my investors is to find out what their borrowing capacity is. In conjunction with a mortgage broker it is a quick exercise and is dependent on many factors in addition to income, equity and cash amount available. All lenders have different policies as which is why it is important to use a licenced independent broker and not just talk to one bank or a broker who is linked to a bank. 28What if interest rates go up? Banks have a responsibility to make sure their clients are not in over their heads. Rate increases or decreases will always be taken into account when finding you the right package and also when interest rates go up, so do rents and house prices so in actual fact you win. 29Am I risking my family’s financial security using equity in my current home? No. You’re not selling off your home, you are simply using the equity you’ve built up over the years as leverage to buy another property. You are enhancing your family’s future. 30They say don’t but with your heart but your head, what does that mean? 31Why not buy an older house and renovate? This option can, and I say CAN, provide some good returns, however you need to get an absolute bargain, be totally dedicated and good at DIY, be prepared with surplus cash for unforseen eventualities and remember the clock is ticking and every day that property is not renting or sold, the bank is taking their interest. On top of that there is no warranty. There are also minimal tax advantages for depreciation which can amount to over $50,000 over 10 years. 32What does it mean, using other peoples money (OPM)? This is one of the strong incentives for buying investment property in that it is not only your money that is growing, you are using the tax mans money, the banks money and the tenants money are all contributing to your investment so in real terms at 7.4% growth, you are getting over 1000% return on your actual investment. 33When and how soon can I purchase my next property to add to my portfolio? We understand everyone’s approach to property is different. We always recommend settling into your first investment, getting comfortable with the strategy, understanding its’ outgoings and evaluating cash-flow before adding to your portfolio. For some investors this is weeks after settlement, months or years. Building your portfolio can happen as quick or as steadily as you wish and the lenders will allow. Self-managed-super-fund is a super-fund that you rollover all your existing funds into one. It amalgamates all your funds into your personal own fund that you can now use to further invest in. Property is one avenue you can use to buy property through a SMSF. 36How do I know if I can afford the property? Affordability is vital and the first thing we do is conduct a complete CNA Client Needs Analysis to determine your real interests. Combine this with our PIA Property Investment Analysis we can quickly identify the actual “out of pocket” cost per week (if any) taking into consideration all outgoings so you can see exactly what you can and cannot afford.